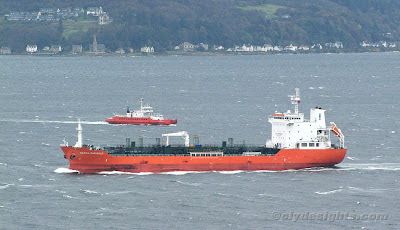 On Tuesday afternoon, the tanker MARIDA MARIGOLD completed her discharge at Rothesay Dock and set sail initially for Brodick Bay, before continuing to Milford Haven. She had arrived upriver late on Monday night with a cargo of fuel from Eastham. Built - like many of her sisters - by Sekwang Shipbuilding in Korea, MARIDA MARIGOLD has a length of 128.6 metres, and a deadweight of 13,133 tonnes. She was delivered in January 2009.